Oklahoma is a state of the south-central United States. There are many famous Native American tribes who played a part in the history of the state and whose tribal territories and homelands are located in the present day state of Oklahoma. The original tribes of the area included the Apache, Arapaho, Caddo, Comanche, Kiowa, Osage and the Wichita tribes. The tribes that were relocated to Oklahoma included the Arapaho, Cayuga, Cherokee, Cheyenne, Chickasaw, Choctaw, Creek, Delaware, Fox, Iowa, Kaw (see above picture), Kickapoo, Miami, Otoe, Modoc, Ottawa, Pawnee, Ponca, Potawatomi, Quapaw, Sauk, Seneca, Shawnee, Wyandotte and Yuchi. The climate, land, history, environment and natural resources that were available to the indigenous Indian tribes in Oklahoma resulted in the adoption of the Southeast culture and some adopted the Great Plains Indians culture. The history and the way of life of Oklahoma Indians was profoundly affected by newcomers to the area. The indigenous people had occupied the land thousands of years before the first European explorers arrived. The Europeans brought with them new ideas, customs, religions, weapons, transport (the horse and the wheel), livestock (cattle and sheep) and disease which profoundly affected the history of the Native Indians. For a comprehensive History timeline regarding the early settlers and colonists refer to the Colonial America Time Period. The history of the State and of its Native American Indians is detailed in a simple History Timeline. This Oklahoma Indian History Timeline provides a list detailing dates of conflicts, wars and battles involving Oklahoma Indians and their history. 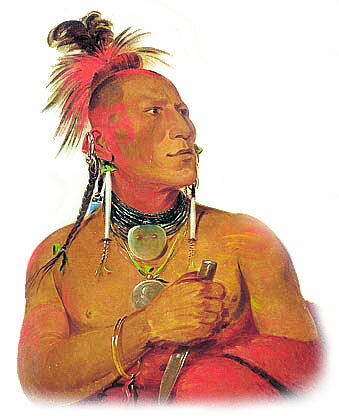 We have also detailed major events in US history which impacted the history of the Oklahoma Indians. Indian Territory was a vast area of U.S. federal territory on the Great Plains reserved for Indians from the 1830s to the 1880s. Indian Territory eventually became the states of Kansas, Nebraska, and Oklahoma. By 1907, when Oklahoma was admitted as a state, Indian Territory ceased to exist. During the 1700's many different tribes from the great Indian Nations were forced to move from their homelands and were granted land in Oklahoma. 1860: Kiowa and Comanche expedition, Indian Territory. To remove the Kiowa and Comanche from the area of the Arkansas River. 1877: A group of 972 Cheyenne were escorted to Indian Territory in Oklahoma. The government intended to re-unite both the Northern and Southern Cheyenne into one nation. The history of the European invasion brought epidemic diseases such as tuberculosis, cholera, influenza, measles and smallpox. The Native Indians of Oklahoma had not developed immunities against these diseases resulting in huge losses in population. Exploitation including the leverage of taxes, enforced labor and enslavement were part of their history, taking their toll on the Oklahoma Indians.